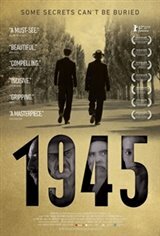 On a summer day in 1945, an Orthodox man and his grown son return to a village in Hungary while the villagers prepare for the wedding of the town clerk's son. The townspeople - suspicious, remorseful, fearful, andcunning expect the worst and behave accordingly. The town clerk fears the men may be heirs of the village's deported Jews and expects them to demand their illegally acquired property back.